(-) Wild Wanderer (+) Elvish Rejuvenator; Swapped out to reduce cost for very similar ability. (-) Sol Ring (+) Lifecrafter's Bestiary; Sol Ring is good but only drawn in first three turns and the Lifecrafter's Bestiary will serve me better I think. hey, +GhostDragon+, sorry about the triple comment, I'm not sure what happened there. 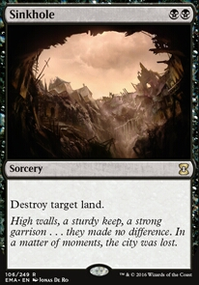 Yeah, it's hard to remember if a card is banned in commander sometimes, so sometimes I just go through the ban list to double check, I've nearly been caught out before. Yeah, I feel like cards like Gateway Plaza are best in five-colour decks that need the colour fixing, and even then, I don't run those type of cards in my Ur-Dragon deck. I'm not sure how likely Contamination is in your meta, I've never played against it, nor seen it used whenever I play. Though my Meta doesn't have don't many black decks, it's more white, Green and red-based decks, so my experiences probably don't reflect yours. As for lands to cut, I would cut Tranquil Expanse, Temple of the False God, Temple of Plenty, and possibly Detection Tower. Tranquil Expanse doesn't seem worth not having a forest/plains, it taps when entering, and gives you nothing. Temple of the False God is not worth needing the five lands to activate it, from my experiences seeing it played at least. Your deck might be able to work it. Temple of Plenty has the same problems as Tranquil Expanse, but gives you a scry, but this deck is going to be doing a lot of shuffling so would it matter? Detection Tower's usefulness is meta dependent. If you aren't facing a lot of hexproof creatures, I wouldn't play it. Huh, I didn't see that combo. That's probably why I'm not a combo player. Emeria, The Sky Ruin is great with ETBs. But I did not see it working with High Market. Well, it is all about what you want to play, so you go with that. It would be cool to see the updated deck. Do you have a specific budget in mind, Under $40, Under $50? 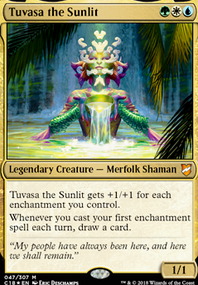 I do have a $50 budget Mirri, Weatherlight Duelist which is a cat-only tribal deck, Mirri, Little Kid Aggro $50 EDH. Might find some interesting budget ideas in there. Riptide Replicator seems really awful, it requires for a cat, so your hoping it's at least 5/5 or more, which means the initial cost is =5 + = . That's a terrible conversion. I understand you want to build your board position since your cats pump each other, but Riptide Replicator is not the way to go. 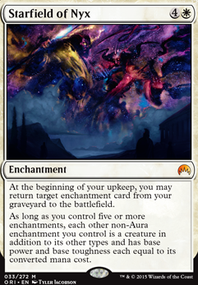 Stir the Pride is way too high a CMC for it's modular (or Entwine) abilities. I would take that one out. Bloodline Shaman I assume is trying to help the draw, which in turn kind-of helps the Bonehoard as well, so let's go with that for now, but is an Elf, not a cat. Creative budget drawing at least. Qasali Slingers is a nice control for Artifacts and Enchantments, plus hes a 3/5 reach. Balan, Wandering Knight might consider, but with only 13 equipment targets, understand why he's not in there. Jazal Goldmane might be a bit better, because he's 4/4 first strike, but he can pump all the horde of cats. Beastmaster Ascension feels like 100% necessary in this, to pump all your 1/1 token cats. I think this will be a primary goal for winning in this budget format. Hunter's Insight is a better draw then some of the "janky" draw mechanics in budget, to a lesser degreeSoul's Majesty / Hunter's Prowess also work but are Sorcery and susceptible to instant removal. Skyhunter Skirmisher has build in evasion and double strike (cat) if you can get him an Equipment or 2. Rancor? Crown of Vigor is not every exciting a 1-shot +1/+1, with a static +1/+1 for 1 creature, not fantastic. Mask of Memory might help with the draw as well. Hungry Lynx, originally I thought this guy would be amazing, but all he does is create problems (deathtouch rats), and I've never had him successfully pump my cats before being removed. I took him out, mechanic didn't work. 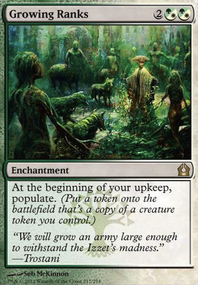 Uktabi Wildcats, this guy only worthwhile if you have 5 Forest, remember, Tranquil Expanse / Selesnya Sanctuary are not forest unless they say "Forest" on them, so with a max size of 11, he's rarely going to be a 5, so no other abilities, not worth the CMC . Do you not find you get board-wiped and that is the end? I would run at least a couple protections, like Make a Stand or Rootborn Defenses or Dusk (recur all power 2 - 19 targets right now). Soul Snare is another janky type Condemn, always Oblivion Ring. Whitemane Lion combos infinite with lost of , but enablers might not work in the budget. There is Infinite creature (several) enablers, Infinite Ramp enablers, etc. Him and Fleetfoot Panther run the show. 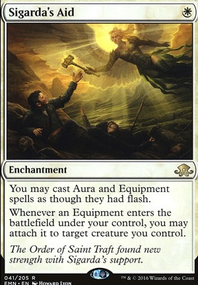 Could be an interesting way to get some combo going, not sure how combos are viewed in your budget pod. Lost Leonin can also put some infect pressure on people, but without support (like Silverblade Paladin/Ajani, Caller of the Pride/that white enchantment that gives 1 creature double strike/etc to make him a single hit kill. He's still a 2 hit-Eminence win-con though. Unless no infect allowed, he will eliminate players just with Eminence on occasion. If you can Grappling Hook him or enable doublestrike elsewise (like Raksha Golden Cub). Often he comes out early enough. 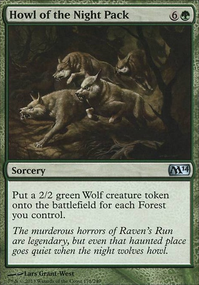 It's my initial strategy in my Arahbo, Roar of the World but I use mass-creature tutor. 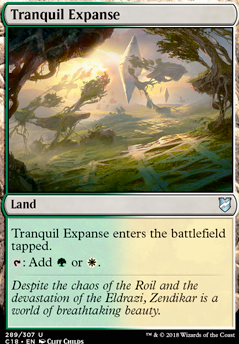 If you aren't going for budget, replacing the Selesnya Guildgate with Temple Garden and Tranquil Expanse with Sunpetal Grove. I would also replace Prodigious Growth withGhalta, Primal Hunger. You have enough ramp that it should be able to work. 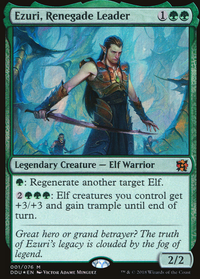 And even though Selesnya Guildmage is an elf, you have too many 2 drops, so adding another Marwyn or two should up your game.